DO-17004-00 was succesfully added to your cart. Can we have this thermometer calibrated at temps other than 50,100, 200, and 230? The testing range is from –12 to 500 °C (10 to 932 °F). Calibration points are usually specific to manufacturer of the IR thermometer if not otherwise specified at the time of purchase. Can I purchase calibration for 2 years ? Can it be sent back after 1 year for calibration ? 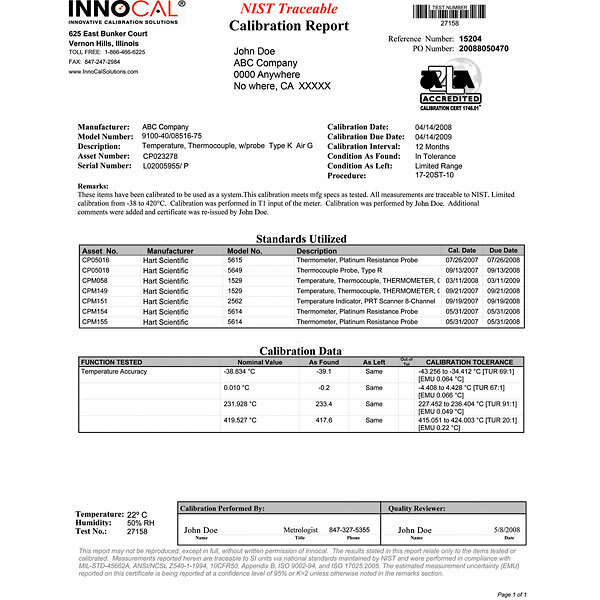 We can provide a calibration interval agreement for any product we calibrate. The frequency of recalibration is determined by the end use requirements or preferences. so the infrared thermom and NIST calibration are seperate from each other? Correct, this is the service to calibrate or recalibrate (to NIST standards) an Infrared Thermometer only. Is this price for the calibration or for the calibrated thermometer? This price is for the calibration of an IR thermometer only. This service works well for us fast turn around times. Looking into calibrating more equipment with this company bacause I am so much happier with them than many of the other companies I have had to work with. The instrument was calibrated quickly and is working properly. We use the product to monitor laboratory temperatures, freezer and cooler temperatures, warehouse temperatures, and controlled processing room temperatures.